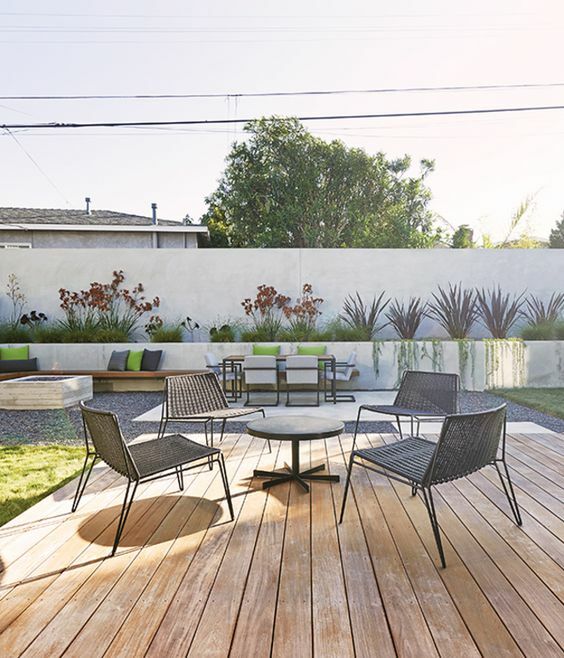 The garden is a place we all enjoy and so a good design focus on the area is important. 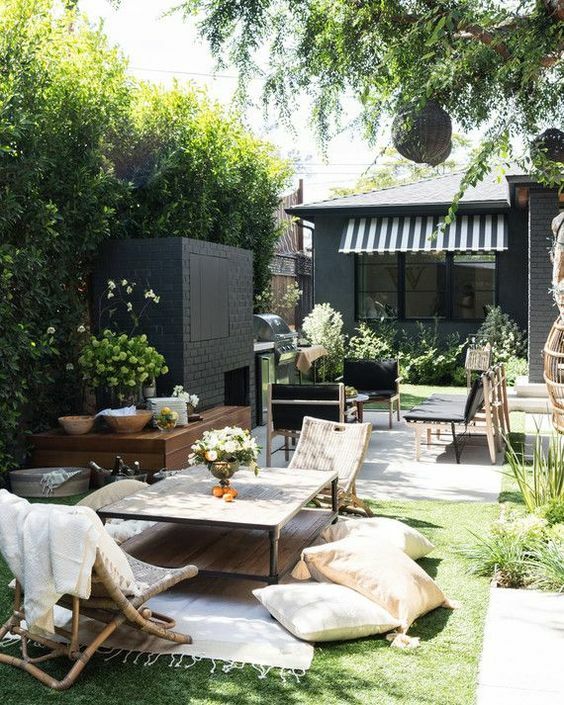 Some choose to go a contemporary route while other feel that is cold and take a more bohemian influence. I like both but feel they both suit different moods. A chilled and cosy vibe for bohemia and a posher more formal feel for contemporary. Either way lets look at some examples and in some cases see how the 2 work together. This design is more on the bohemian spectrum with it’s hemp style rug and mass of cosy cushions. 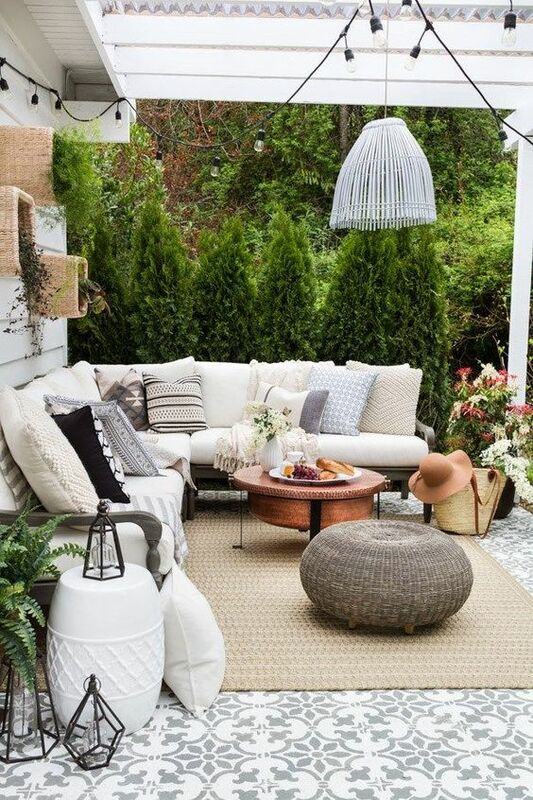 The woven foot stool and soft furnishing make this an inviting corner to chill in. 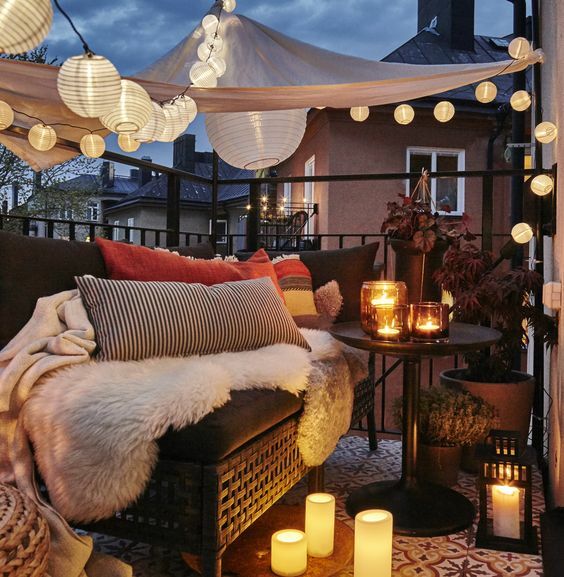 Candles add a lot to a scene, especially when at night and the yellow glow refracts around the outdoor environment. 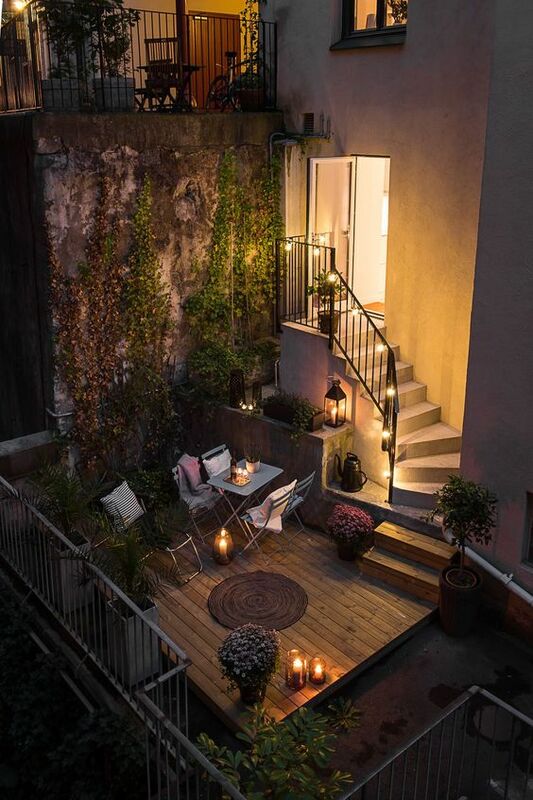 This small terrace has a rustic feel with ivy growing up the wall, basic garden furniture and mentioned candles. Now we see a contemporary example and the flow from inside out living. 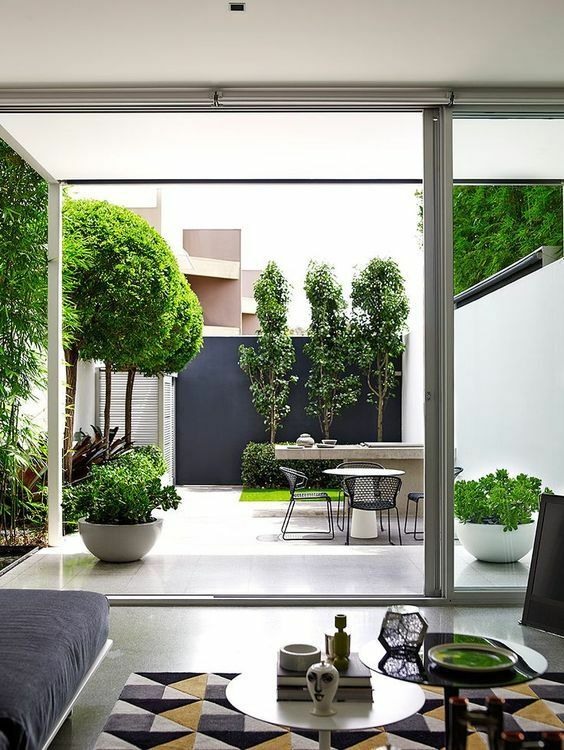 The straight lines give a neat and clean feel to the garden and result in a very classy use of a small space. 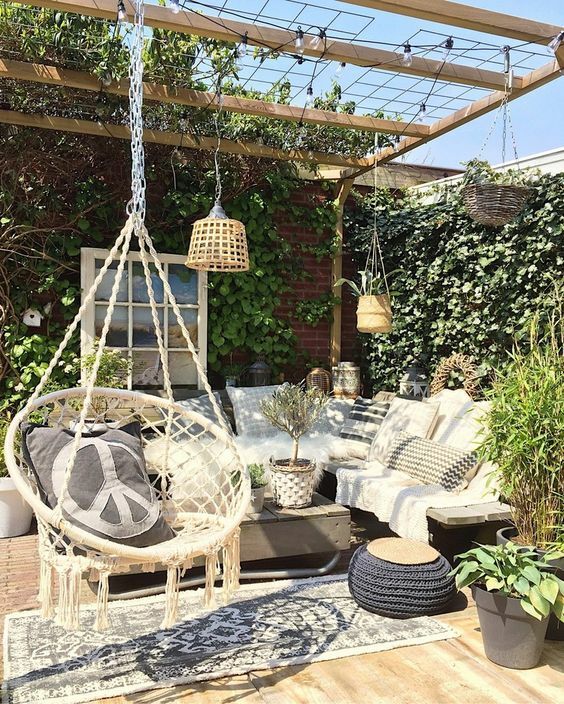 Much like the first image this shows off the woven and soft furnishings feel with a stylish string swing chair and home made coffee table. To reinforce the bohemian feel even more they opted for a peace pillow. This look shows that you can still get style on a budget. This would surely not be a year or even week round set up in England with a rug on the grass but it adds a nice feel to the scene. 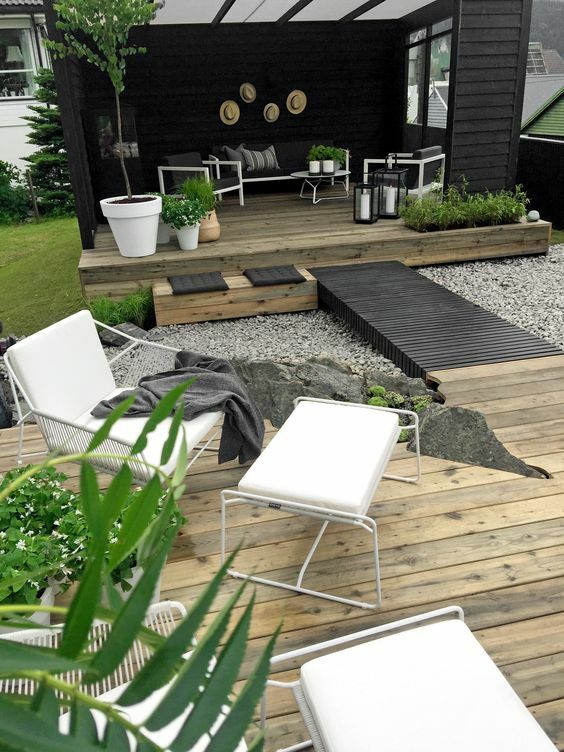 It brings the idea on outdoor living to a new level and this is pretty much moving the lounge to the garden and enjoying the sun… why not? Still using lighting to add to the mood this product shot for an outdoor sofa is a small show garden with tropical vibe and the pergola gives a separation from garden to social room without ever going inside. This scene is clearly set up for the shot but still it looks very nice. 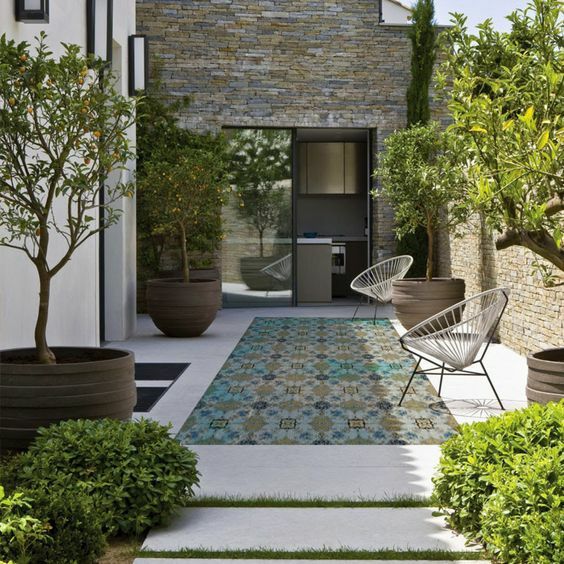 In reality the chairs would be closer as conversation would be a little awkward from 3 metres away but the neat lines, grass planting between the paving and limited colour pallet make this one of the most stylish examples. Bringing a real Scandinavian touch to the equation this set was designed for TV2. Using a stylish, limited colour pallet like the shot before and varied levelling to break up the design and give the feel of different areas. I love it as it is a nice combination of the 2 contemporary and bohemian styles. 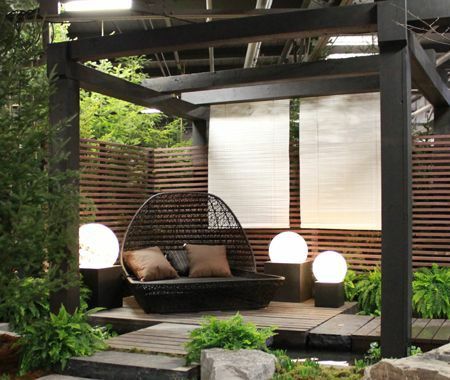 This final look is probably the most simple one here with a deck that is unusually in the middle of the garden but seemingly placed to capture the last of the evening sun. In the background can be seen some seating running along the edge of the garden with raised planting for easy maintenance.